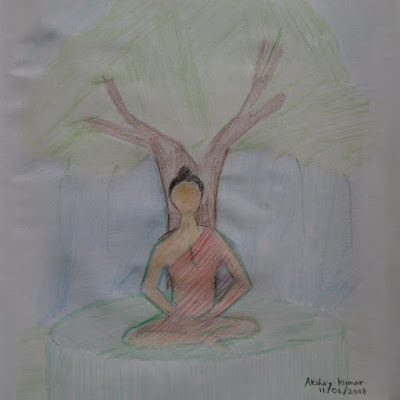 This is a drawing of Buddha meditating under the Bodhi Tree. Bodhi tree also known as Peepal in hindi is a very large tree in Bodh Gaya, Bihar under which Siddhartha Gautama who later became known as Buddha attained enlightnment. Buddha meditated for 49 days under the bodhi tree. Meditation can be defined as a practice where an individual focuses their mind on a particular object to achieve a mentally clear and emotionally calm state. Color Pencil Drawing on A4 paper.